Paul Delnero received his PhD in Assyriology from the University of Pennsylvania in 2006. He has been a faculty member at Johns Hopkins University since 2008. 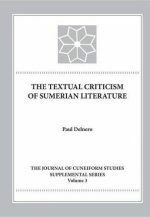 His first book, The Textual Criticism of Sumerian Literature (Journal of Cuneiform Studies Supplemental Series vol. 3, ASOR Publications, Boston, 2012), considers how semantic, orthographic, and grammatical variants in copies of Sumerian mythological compositions and hymns provide an essential, but overlooked source of evidence for tracking how cultural knowledge was transmitted and consumed in Ancient Mesopotamia, while also proposing a methodology for critically evaluating textual variation in the sources for Sumerian literary works. In addition to articles on the topics of the role of memorization in Mesopotamian scribal education, the role of Sumerian religion and mythology in identity formation, the social and cultural contexts for lamenting in early Mesopotamia, and other subjects relating to Mesopotamian religion, literature, education, textual archives, and ritual, he is the co-editor of the book, Texts and Contexts: The Circulation and Transmission of Cuneiform Texts in Social Space (Studies in Ancient Near Eastern Records, de Gruyer, Berlin, 2015), a collection of studies on the materiality and social function of ancient Near Eastern texts from different periods and genres. He is currently in the process of completing a book on ritual lamenting in ancient Mesopotamia. 2016 "Literature and Identity in Mesopotamia during the Old Babylonian Period," Pp.19-50 in Problems of Canonicity and Identity Formation in Ancient Egypt and Mesopotamia, ed. K. Ryholt and G. Barjamovic. CNI Publications 43. Museum Tusculanum Press, Copenhagen. 2015 "Texts and Performance: The Materiality and Function of the Sumerian Liturgical Corpus," Pp. 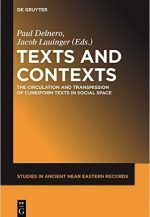 87-118 in Texts and Contexts: The Circulation of Cuneiform Texts in Social Space, ed. P. Delnero and J. Lauinger. Studies in Ancient Near Eastern Records (SANER) 9. de Gruyter, Berlin/Boston. 2015 "Reassembling the Social from Texts and Contexts," (with Jacob Lauinger), Pp. 1-26 in Texts and Contexts: The Circulation of Cuneiform Texts in Social Space, ed. P. Delnero and J. Lauinger. Studies in Ancient Near Eastern Records (SANER) de Gruyter, Berlin/Boston. 2013 "On the Sumerian Liturgical Tradition." Orientalistische Literaturzeitung 108: 145-51. 2012 "Memorization and the Transmission of Sumerian Literary Compositions." Journal of Near Eastern Studies 71: 189-208. 2011 "Inana and Ebih and the Scribal Tradition," Pp. 123-149 in A Common Cultural Heritage: Studies on Mesopotamia and the Biblical World in Honor of Barry L. Eichler. Eds. G. Frame et al. CDL Press (Bethesda, Maryland). 2010 "Sumerian Extract Tablets and Scribal Training." Journal of Cuneiform Studies 62: 53-69. 2010 "Sumerian Literary Catalogues and the Scribal Curriculum." Zeitschrift für Assyriologie 100: 32-55. 2009 "The Sumerian Verbal Prefixes im-ma- and im-mi-," Pp.535-561 in Language in the Ancient Near East - Proceedings of the 53th Rencontre Assyriologique Internationale, Moscow-Saint Petersburg, 23-28 July 2007. Eds. L.Kogan and N.Koslova.